If you see burn marks on the cut edges of wood after you cut them with your table saw, it is because excessive heat from the saw blade is scorching the stock as it passes through the wood. There are three reasons why this can occur. Make sure that the blade is sharp, clean and free of pitch. A dull blade will make it hard to cut quickly, and the slower the feed rate of the saw, the more friction against the wood and the greater the likelihood of scorch marks. 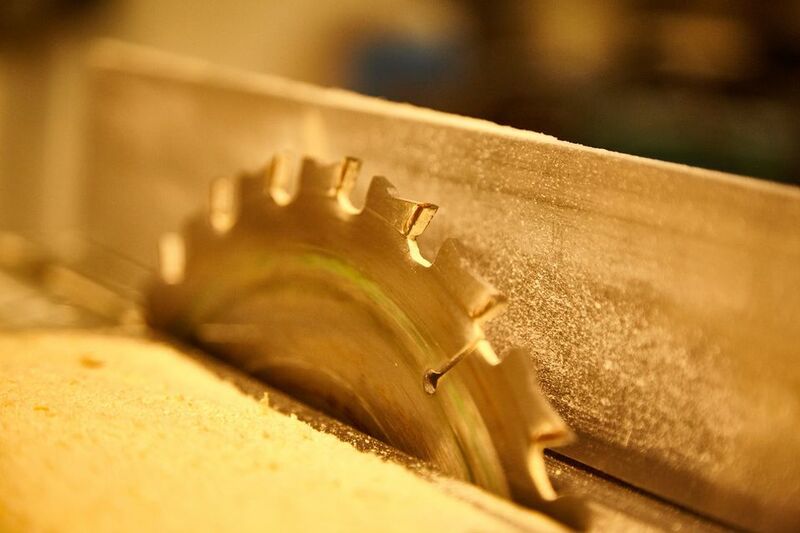 Pushing the stock through the saw too slowly is a common cause of saw blade burn. Sometimes a blade that feels dull might only be dirty. If wood pitch resins build up behind the teeth of the blade, the cutting speed will slow down, increasing the chances for burns. Commercial blade cleaners are sold for this purpose. If the saw blade and guide fence are not perfectly aligned, the stock tends to push sideways against the fence as you feed it through, creating more pressure and friction on the wood. Measure between the blade and the fence at both front and back of the blade and if the measurements aren't exactly the same, check your saw use-and-care manual and adjust the blade alignment so it is correct. Woods like cherry or soft maple are more susceptible to burning, and they will need to be fed faster in order to prevent burns. Experience with different wood species will eventually teach you optimal feed speeds for different types of wood and thicknesses of stock. While slow feed speeds create smoother cuts, they also make burns more likely. Finding the not-too-fast, not-too-slow feed speed takes some practice. If you have burns on your stock that you need to remove, you can try sanding them out, but you might have a bit more luck using a wood plane or a sharp, flat scraper. If you make the proper adjustments to your saw before you begin the project, you'll decrease the chances that you'll have to deal with saw blade burns.